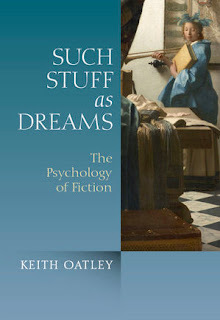 I am very pleased to announce that today my book Such stuff as dreams: The psychology of fiction (Wiley-Blackwell) is published in North America. It was published last month in Europe. Here is what the kind people at Wiley-Blackwell say about it in their blurb. Such Stuff as Dreams explores how fiction works in the brains and imagination of both readers and writers. In this ground-breaking work, Oatley richly illustrates how fiction represents, at its core, a model that readers construct in collaboration with the writer. This waking dream enables us to see ourselves, others, and the everyday world more clearly. 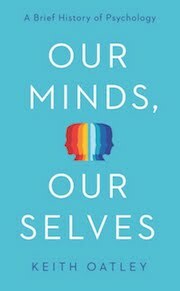 Informed by deep scholarly rigor, this is an illuminating and thought-provoking analysis of the transformative power of fiction to enter and engage the mind into revealing profound insights about ourselves and those around us. 7. Effects of fiction: Is fiction good for you? When I started the book my idea was that it would be the third in a series of books on the psychology of fiction, the previous two being Jerry Bruner's (1986) Actual minds, Possible worlds, and Richard Gerrig's (1993) Experiencing narrative worlds, but I was (perhaps) scooped by Norm Holland with his 2009 book Literature and the brain, though the purpose of Norm's book is somewhat different. The idea for my book is to explore the fiction as simulation of social worlds, and to treat a small number of works of literature by William Shakespeare, Jane Austen, Kate Chopin, Anton Chekhov, James Baldwin from both a literary and a psychological point of view. I write about some traditional aspects of fiction, including character, plot, setting, and theme, together with techniques such as metaphor, metonymy, defamiliarization, and cues to the reader. 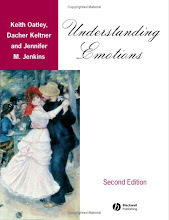 I include writing and reading fiction, as well as empirical results on the reading of fiction. I also reflect the change that is occurring as interpretation moves from classrooms to conversation in reading groups and the like. In style my idea was not only should fiction be able prompt the reader's own thoughts and feelings, but that nonfiction might do so too. So although there is a scholarly argument and evidence (both implicit and more explicitly in the notes), I don't always say what conclusions you might draw. Instead I make suggestions and offer contexts so that you can have your own thoughts and feelings. Holland, N. N. (2009). Literature and the brain. Gainsville, FL: PsyArt Foundation. Oatley, K. (2011). Such stuff as dreams: The psychology of fiction. Oxford: Wiley-Blackwell. This is very interesting stuff. I only have anecdotal evidence, but I sell fiction and non-fiction books for children aged from 4 to 14 years, and I have found that the "reluctant" readers, especially boys, have trouble letting the voice of the author in. It seems to me that you learn by modeling ( parents and teachers reading to you ) or by peer examples, that it is safe ( and later rewarding ) to let another persons mind enter yours. And until you feel able to do this, you resist reading, or take to very neutral non-fiction. Your research supports this in that it shows that letting another's voice into your mind is powerful and change making of your perceptions. So it no wonder an insecure young reader resists opening this particular door. I am glad you find our blog interesting, Tom. I find what you say, as a book-seller, very interesting, too. The way you put it is very cogent. 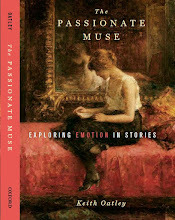 The first study we did, here in Toronto, on the psychology of fiction, with Angela Biason who was then a graduate student, was to assign boys and girls in high-school English classes to read either a short story by Alice Munro that had a female adolescent protagonist, or a short story by Carson McCullers that had a male adolescent protagonist. The girls were able to identify equally well with both the male and the female protagonist. The boys—exactly as you say—found the story with the female protagonist was difficult to let in, but they were OK with the story that had the male protagonist.